One of my most favorite feelings is the luxurious sensation of wearing something soft and feminine. No matter what day it is or where I have to be, (or not be), the minute I put something lovely on…I instantly feel pretty. You know what I mean, right? So when I discovered Plum Pretty Sugar and their feminine collections of whisper-soft fabrics in enchanting patterns and garden-inspired palettes, I knew I had found my own pretty heaven. I haven’t written many products posts because I only want to promote items I believe in 100%. To be able to personally attest to anything I share here is an absolute must. This means when I write about something, you can be sure I myself would buy and happily wear or use it! 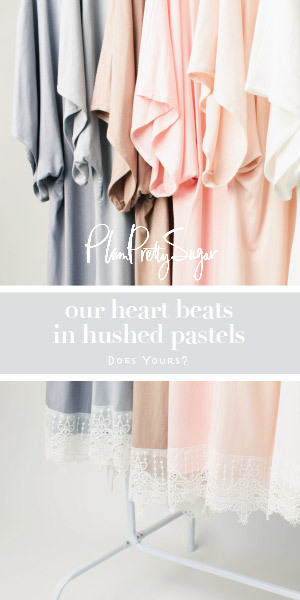 In case you’re not familiar with Plum Pretty Sugar, they were founded in 2009 as a line of apparel, accessories and home décor products inspired by a relaxed, feminine and effortless way of living. With four other beautiful collections, – Plum Pretty Sugar Signature Collection, Plum Pretty Sugar for BHLDN, Castelbel & Trumpet, and Lilli Tru – today I’m thrilled to help announce their delightful new line of classic geometric prints in chic shapes and feminine silhouettes, topped with tassels and a flirtatious touch of French. So without further ado…introducing PomPon a chic new collection from Plum Pretty Sugar. Inspired by the comfort of wearing your boyfriend’s shirt, this silhouette is a refreshing take on a borrowed-from-the-boys classic. Part nightshirt, part robe and part cover-up, this piece goes from lounging to getting ready to out by the pool with a quick change of accessories. These mix and match patterns for brides and bridesmaids with a button up front to make getting ready for the big day and beyond easy and pretty. Just think how cute your bridal party getting ready shots will be with an assortment of these pretties! Even better, you can wear them again and again after the wedding. Truly! There is nothing more flattering than a classic skirt. The Cloe skirt creates an elegant and statuesque silhouette that can be dressed up or dressed down for day to day wear or for any occasion. A take on the party skirt, this piece can be mixed and matched and is both fun and beautifully feminine. These skirts are perfect for engagement parties or the night before the wedding, or just to wear out and about. And you can wear them again and again. They can also make great bridesmaids gifts along with a matching robe to get ready in! The white tank is also available in the collection. The Simone Tank is a smooth and flowy top that can be comfortably worn with pajama bottoms or tucked into jeans or a skirt. It’s the perfect necessity for any closet! A short robe should be a must in any woman’s collection of lounge wear, especially in the warmer months when you need a little cover up just out of the shower or perhaps a lounging morning with your honey. This versatile robe with clean lines is a timeless statement that fulfills a way to be pretty that isn’t floral. This maxi length silhouette is stunning and flattering. A beautiful long-length drape, a slightly cowled collar and a straight sleeve alongside a fun tassled belt, make this robe luxe and ultra-wearable. For the colder months, this one is a must. It’s also pretty perfect for ladies who like a bit more coverage any time of the year. It’s complete sexiness in a more demure way! A revamped classic. The Noelie Shirt Dress features the ease of a tunic and the flattering silhouette of a dress. For day to day wear or any occasion, this dress has a soft neck, figure cinching belt and small side slits. This should also be in every woman’s closet. I plan to add one or two to mine as soon as possible! The perfect layering piece. This easy to wear and flattering sleeveless shell is slim-fit and can be mixed and matched with many PomPon pieces as well as worn simply with jeans. All items come in the following colors: Bonbon, Ciel, Coquette, Macaron, Pomme, Verite. Plum Pretty Sugar products are made using cotton voile and Habutai silk, are priced from $18 to $158. Love the patterns and all the colors!